IP Office supports SIP, which is a signaling protocol used for creating session oriented connections between two or more locations in an IP network. SIP trunking is a service offered by an ITSP (Internet Telephony Service Provider) that permits businesses with an IP Office installed to use Voice-over-IP (VoIP) outside the enterprise network by using the same connection as in Internet connection or a separate connection, if desired. A connection that provides priority for SIP traffic shared across a WAN is needed to maintain call quality. If implemented properly, using SIP can save you money. You can order SIP trunk channels (concurrent sessions) as you need, where a full T1/PRI is 24/23 channels. Even with a “minimum” channel offer for T1/PRI, you still require hardware (card) to connect the circuit and of course, the circuit has to be delivered or a handoff from provider equipment. Some advantages can be when a call connects to other SIP parties where the PSTN is not involved (true data connection end to end). Calling from branch to branch is again, using the data network for the call which doesn’t cost anything if you already have the network in place. SIP calls to a user work much like a PRI does where you can have a direct dial number (or SIP address) and with functions like twinning (supported on PRI and SIP, but not with Analog trunks), you can stay connected to your office. Presence and IM are indeed helping businesses connect with clients. SIP indeed, is the future and at some point, there may not be a PSTN as we know it now. If set up incorrectly, it can end up costing a lot. A lot in fraudulent toll calls. Often the setup costs are low to get started with SIP however, there are security concerns with SIP. Much to do with the way in which SIP integrates with everything. That is, how SIP has to know how to connect to others and how to ring the right devices. And then to have a secure SIP connection, each “link” would need to support varying security methods to encrypt the SIP signaling as well as protecting the actual audio or “media”. As for connecting IP Office to a SIP trunk provider, there are many ITSP’s out there. Since SIP is based on the many RFC’s written by and for implementing SIP and associated components, there are as many interpretations. Therefore, it is best to make sure that a provider you're considering can integrate with IP Office. There is more to consider when you look at the connectivity design requirements for your business needs. IP Office does not encrypt either the SIP signaling or media (audio) which can be captured and played back by others. Having SIP trunks generally means a public connection to an ITSP where there is a vulnerability to attacks and other threats to businesses. To protect against these, a Session Border Controller can be used to separate the connection from the network and internet or ITSP. Protecting against eavesdropping, toll-fraud, spoofing, along with Denial of Service attacks are some of the types of threats an SBC can provide. IP Office 4.0 and higher supports the use of SIP extension devices with the IP Office system. These can be SIP phones, SIP software clients or traditional analog devices attached to the SIP Analog Telephony Adapter (ATA). Within the IP Office configuration, SIP extensions are licensed using the 3rd Party IP End-points license which is also used for non-Avaya H323 IP extensions. The number of SIP extensions supported is subject to available licenses and to the normal extension limits of the IP Office control unit being used. Unlike H323 IP devices which always support at least one G711 codec, SIP devices do not support a single common audio codec. Therefore it is important to ensure that the IP Office SIP extension codecs configured match a codec for which the SIP device is configured. 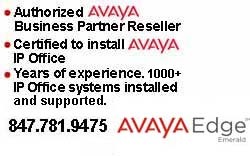 Beyond basic call handling via the IP Office (see the features listed below), the features available will vary between SIP devices and Avaya cannot make any commitments as to which features will or will not work or how features are configured.